Image Courtesy of Simone Ferracina. Our series on the several general ways in which architects and designers have addressed the animal question continues with Post Animal Alternate Reality Projects. Previously we had presented two other categories, synathropic habitats – the most popular and synthetic approach seen thus far and soft structures, a more landscaped-based strategy to adressing non-human life. These two previous strategies, though different in their basic assumptions do wind-up proposing solutions – built, or more often ideal solutions – and they in that sense share a sense of pragmatism. 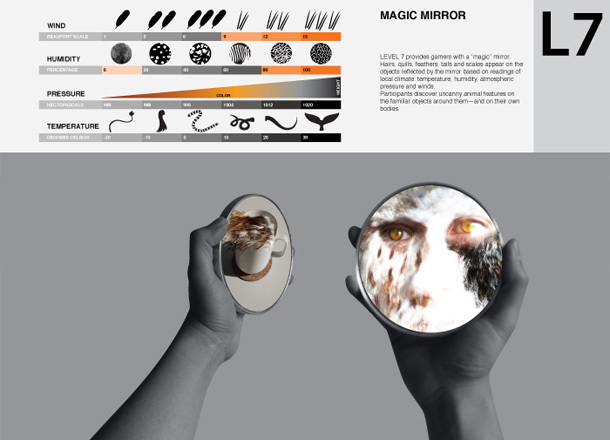 Both Synathropic Habitats and Soft Structures propose solutions that could be implemented in the world to solve a problem. But this is not the only strategy. A third category of projects approaches the human/animal divide from a very different source. The Post-Animal Alternate Realities (PAARP), demonstrated by Simone Ferracina, Natalie Jeremijenko, Animal Super Powers and Alison Hunter to name a few, seek to change the hearts and minds of human individuals. These are the art-pieces, installations, virtual reality games, temporary interventions that directly aim to change the way humans think, and obliquely to influence the way we live. Simone Ferracina’s 2011 Winning Animal Architecture Awards project (fig. 3), Theriomorphous Cyborg, is one of the most intriguing projects of this field. In the project Simone asks individual gamers to enter into the world of another animal through a projected 3D Virtual Reality interface. Within the alternate animal world, the human is able to experience sight, sound, touch and smell through the senses of other animals. For example in the first level, sight is augmented with electro-magnetic sensory perception to simulate bird’s eye viewing; on the second level real-time imagery is overlaid with pre-recorded footage to simulate the distorted vision and time-perception from the vantage point of a snail. Each of the subsequent levels in Simone’s proposed virtual reality environment send the viewer further and further from his/her subjective reality. Allison Hunter’s portrayals of animal worlds, The Animal Super Powers project and several projects by Natalie Jeremijenko all perform similar de-humanising or un-humanising effects on the viewer. Indeed the general effect of the PAARP is to somehow tease, force, or push the human out of its own subjective reality and into the world of another animal. And somewhat unlike the “liveable other worlds” of Haraway these are the Umwelten of Jacob Von Uexkull. In these PAARP we are asked to leave the comforts for our Human-centric worlds and to join Jacob Von Uexkull on his famous sunlit walk in a wild, insect teaming field. We begin such a stroll on a sunny day before a flowering meadow in which insects buzz and butterflies flutter, and we make a bubble around each of the animals living in the meadow. The bubble represents each animal’s environment and contains all the features accessible to the subject, as soon as we enter into one such bubble, the previous surroundings of the subject are completely reconfigured. Many qualities of the colorful meadow vanish completely, others lose their coherence with one another, and new connections are created. A new world arises in each bubble. But instead of having to imagine each individual creature suspended in individual soap bubbles, we are now equipped with VR goggles and, in a retro-Haraway manner, with cyborgian, alternate animal sensing devices attached to our appendages, we can step directly into the bubble-worlds of other animals – or so we are lead to believe. One has to admit that there is an enormously attractive quality to the Post Animal Alternate Reality Projects. Other than simply being literally fantastic projects (who wouldn’t want to be a bat or bird for a few minutes?!) is the amazing potential to use these experiences to guide the design processes of the previous two groups of projects. And while they may not directly address the architectural or design considerations of the Synanthropic Habitats or Soft Structures, the potential for meaningful, if perhaps virtual, cross-species experiences is almost irresistibly seductive. So what is the total effect here? 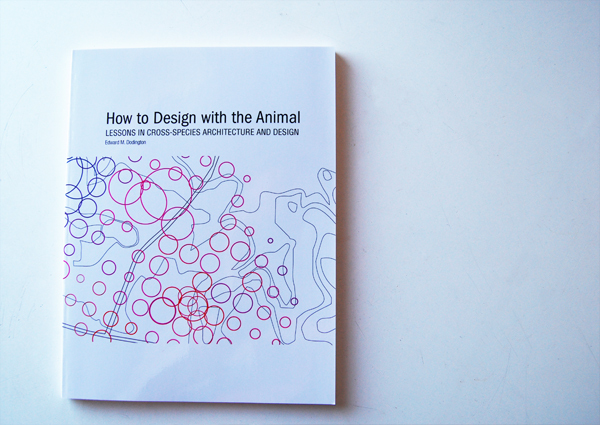 What can we learn from the three types of projects found on Animal Architecture? Currently we have seen projects that design new homes for animals, re-think human urbanism and introduce us to virtual animal realities. And yet, the sum of the work, the conclusion seems to always be out of grasp. The slogan for Animal Architecture is Explorations in Cospecies Coshaping. A phase also borrowed from Donna Haraway. My point is simple: Once again we are in a knot of species coshaping one another in layer of reciprocating complexity all the way down. Response and respect are possible only in those knots, with actual animals and people looking back at each other, sticky with all their muddled histories… It is a question of cosmopolitics, of learning to be “polite” in responsible relation to always asymmetrical living and dying, and nurturing and killing. That sounds good, but is that what we have in the three groups of Animal Architecture projects here? Have we seen this condition of coshaping effectively present in any of the projects discussed? I’m not sure. For all of the projects what they seem to desire is this idea of Cospecies Coshaping – the reciprocal and intertwined layers of being and becoming across species. But the Bat Clouds, Bird Scrapers and Hive Cities shy away from close animal – human interactions, and the virtual reality games always remain just that — virtual. Behind all of this is the nagging reality of a human agent always pulling the strings, mediating the interaction and more or less designing the experience. But we should not for these reasons lose faith in the project. The hope, the belief is that the answer lies somewhere among this constellation of projects. That with continued work, research, combinations, permutations and evolutions of each– a virtual and actual world where animals of all kinds – humans and others actively participate in shaping and reshaping their respective lives – can be achieved. The work collected here and on AnimalArchitecture.org has attempted to show that animals can be involved in the design and planning of a city, a home, a factory and a farm. There is an obviously fantastic quality to many of the projects but designers and thinkers such as Joyce Hwang, Natalie Jeremijenko, Simone Ferracina, Donna Haraway, Cary Wolfe and others each show that such prospects are becoming increasingly popular and no longer completely out of the realm of the possible. We have the theoretical backgrounds of Uexkull, Haraway, Derrida and others to guide us. What we need now are inventive and sensitive design scenarios to transform the theory into practice. It is the challenge of the designers, those who daily define and reaffirm certain proscribed ways of life, to ¬set this new discourse into motion. Hopefully with time, some imaginative design work, humility and some luck we may one day discover (build?) just such a world and achieve a sense of peace with our mess-mate co-designers, becoming one with many.